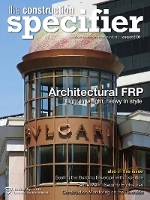 This article appeared in The Construction Specifier, August 2009. For a printable pdf of this article, please click here. Detail showing how FRRP is installed directly to a non-combustible substrate or fireblocking. Image courtesy Architectural Fiberglass, Inc.
Each column used 14 individual FRP units to replace more than 100 distinct terra cotta units. Hundreds of lineal feet of specialized, decorative cornices for several floors of the tower have also been replaced. In as little as 12 weeks, custom molds from the existing terra cotta were manufactured and finished parts were delivered to the site. The lightweight FRP replicas were brought into the building up freight elevators, eliminating the need for cranes and large support structures. The 32 maintenance-free FRP replicas cost about the same as four new terra cotta columns. (The sealant or caulking used with the FRP composites and adjacent material may need minimal maintenance.) Additionally, lead times with terra cotta would have added more than a year to the project. * "Corinthian capital" is a generic term that describes the decorative style of the capital or the decorative top portion of the column. Corinthian refers specifically to one of the five classical orders of architecture created thousands of years ago by the ancients Greeks and Romans. Photo courtesy Architectural Fiberglass, Inc.
A 4 x 8-m (13 x 25-ft) tower of fiber-reinforced polymer (FRP) replaced an old rotating unit near collapse at the Akron Beacon Journal's building in Ohio. FRP materials enabled the manufacture of an art deco design that matched the original Indiana limestone construction. 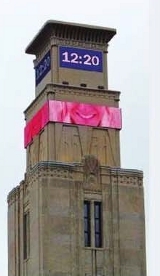 The tower uses state-of-the-art electronic display technology and is a new focal point for downtown Akron. Individual FRP panels were easily mounted to a new steel support frame. The material was chosen because of its light weight and ability to reproduce the complex shapes in an efficient and economical manner. Decorative stone elements would have been cost-prohibitive and created an aunsupportable burden on the existing structure. FRP elements enabled the project to take less than seven months from concept to completion. Furthermore, reworking the tower in stone would have cost $700,000 to $800,000, compared to $75,000 in fiber-reinforced polymer. At 327 Central Park West in New York City (top photo), parapet-level replication of terra cotta cornice was necessary. Approximately 64 lineal meters (210 ft) of fiber-reinforced polymer (FRP) replacement cornice includes integral 'Spanish Tile' Mansard roofing. The molded-in color and finish combine a gray façade with burgundy tiles and plaques, which are indistinguishable from the originals. The 16-story structure was built in 1929 and is a recognized New York City landmark. This FRP cornice is part of almost 32 km (20 mi) of replicated cornice work by the manufacturer that met the rigorous scrutiny of the New York City Landmarks Preservation Commission (LPC) for shape, detail, and color-matching accuracy. The main advantage of choosing FRP over terra cotta and other masonry products is the material's significantly lower weight, which reduces structural steel support requirements and related labor and installation costs. FRP also allowed individual elements to combine into larger units that further contributed to simpler design and lower installed costs. 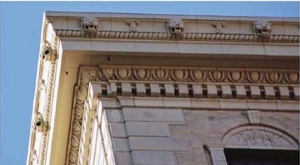 At 580 Park Avenue (bottom photo), the design challenge included recreating integral lions' heads incorporated into a 914 mm (36 in) high and 864-mm (34 in) projection cornice. The 113 lineal meters (370 ft) of durable FRP on this 14-story landmark built in 1923 looks like terra cotta, but eliminates the potential danger of aged pieces failing, breaking off, and falling. Due to the precise replication, it is difficult to determine where replacement FRP has been used, proving the material's suitability for aesthetically sensitive restoration projects. 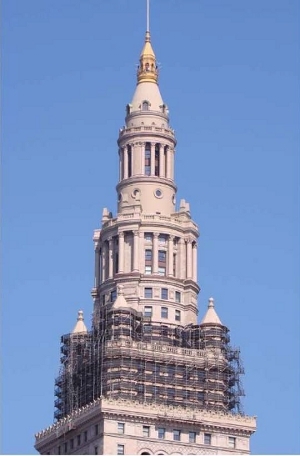 Photos courtesy Architectural Fiberglass Corp.
At Cleveland, Ohio's Terminal Tower, scaffolding is being removed from the top portion of the tower, revealing the decorative features that have been replaced with fiberglass replicas. It is nearly impossible to distinguish the new FRP from the structure's original material, which is more than 80 years old. Acoustically reflective FRP walls at Chicago Symphony's Ravinia Festival Outdoor Pavilion in Illionois. Photo courtesy William Kreysler & Associates, Inc.
A NEW SECTION IN THE 2009 INTERNATIONAL BUILDING CODE (IBC) COULD ENCOURAGE MORE ARCHITECTS, SPECIFIERS, AND BUILDING OWNERS TO USE ARCHITECTURAL FIBER-REINFORCED POLYMER (FRP) COMPOSITES IN BUILDING CONSTRUCTION. Generally, U.S. Cities, counties, and states that establish building codes for their jurisdiction adopt sections of IBC as written, or add or subtract language to suit particular needs and preferences. As evident in thousands of applications throughout the United States, FRP is a proven architectural material. Although it offers similar or greater strength than alternative materials (such as steel, aluminum, concrete, and limestone), FRP is lighter in weight (Figure 1). Consequently, the material costs less to ship and install, and reduces the load on buildings and support structures. FRP practically eliminates maintenance because it does not rust like metal, rot like wood, or endure damaging moisture intrusion like terra cotta, stone, and concrete. However, maintenance depends on surface texture. Some FRP is designed to last for more than 20 years without care, while most others need attention similar to that of painted surfaces. 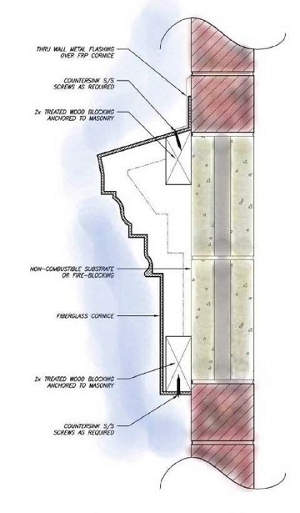 FRP is a cost-effective architecctural solution for restorations and new construction (Figure 2). It has approximately the same installed cost as glass-fiber-reinforced concrete (GFRC), but is lighter in weight and requires less structural support. It is also more durable, because it does not chip, stain, or deteriorate like GFRC. For restoration projects, FRP is often ideal for replicating surface features, color, and shape of the original material — it can be made to match textures ranging from smooth to coarse. For new construction, architectural FRP offers a host of custom design features limited only by the imagination. Despite these varied benefits, architectural FRP has only enjoyed limited use in the absence of a uniform code. Instead, flame spread and other performance requirements have been established on a case-by-case basis between FRP manufacturers and local building authorities. The primary force behind the addition of FRP language in the 2009 IBC has been the Architectural Division of American Composites Manufacturers Association (ACMA). To draft a proposal for code changes that incorporate fiber-reinforced polymer composites, ACMA enlisted the help of fire protection authority Jesse Beitel, senior scientist and principal for Hughes Associates in Baltimore, Maryland. "To be in a position to present a lower bid, some manufacturers in the past would cut corners and use practices that typically led to mediocre products," said Beitel. "The subpar performance of those products was often a reflection of the entire industry, not just the manufacturer." Beitel believes the additions in the 2009 IBC validate fiber-reinforced polymer as a legitimate material of construction by setting the bar high for everyone to follow. ACMA adopted the criteria used for foam plastics as a basis for FRP standards, because of how effectively the existing code section addressed fire performance of foam plastics in exterior walls. For both materials, the code explicity states specific tests must be passed for multi-story use, radiant heat, flame spread, and smoke-developed indices. Other requirements cover live, snow, wind, and earthquake loads. As the code measures performance without mandating how to achieve performance targets, manufacturers can engineer fiber-reinforced polymer material systems to be application-specific. 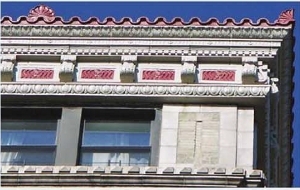 One of two exceptions to the new general code requirements for FRP composites applies to uses of the material as building ornamentation, such as cornices. This exception limits the size of the ornamentation and its flame spread index requirement based on the percentage of fiber-reinforced polymer material on the wall. The code also requires FRP ornamentation to be installed directly to a noncombustible substrate or separated from the exterior wall by code-approved, fire-blocking materials. In addition, the installation's design must meet structural conditions already established in the code. The second exception to the general code for FRP recognizes the material can be used on buildings higher than 12 m (40 ft), in a manner consistent with other materials. This set of requirements provides assurance the materials employed in these applications are appropriate and do not create any undue hazard. Architectural fiber-reinforced polymer has myriad characteristics. The following diverse examples illustrate how FRP can be suitable in a range of applications. 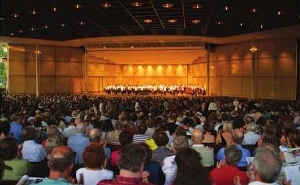 Acoustically reflective, advanced composites wall panels produce excellent sound quality for the Chicago Symphony's Ravinia Festival Outdoor Pavilion in Illinois. The panels have a density of 20.6 kg/m2 (4.2 lb/sf) and employ a sandwich construction. Inner and outer layers are composed of rigid panel comprised of biaxially oriented glass strand reinforcement in isothalic polyester resin. The sandwich core is a polyvinyl chloride (PVC), closed-cell, structural foam core. Special testing was required in order to demonstrate the panels' ability to meet Class I fire resistance requirements. In this case, the acoustician specified the wall panels must be 196 kg/m2 (40 lb/sf), but any material was acceptable. The obvious solution was precast concrete, except the building was already built and the roof trusses were not strong enough to rig from. Some panels would weigh over 4000 kg (9000 lb). This novel solution was to engineer and build hollow panels out of FRP, which could be lifted from the roof trusses and installed onto the backup structure. After installation, the hollow spaces inside the double wall panels would be filled with dry sand, thus increasing the panels to 196 kg/m2. There are nearly 60 tons of sand in these panels. Architectural fiber-reinforced polymer has myriad characteristics. Moving forward, the challenge lies in educating design/construction professionals on its benefits and strengths compared to alternative materials. David H. Murdock, owner of Castle & Cook and Dole Foods, purchased a huge, abandoned textile mill site with plans to create a research campus for biotechnology. The first building and center of the North Carolina Research Campus is the Core Lab in Kannapolis, which has since been surrounded by various facilities built by several state universities. In keeping with the character of the historic mill town and surrounding area, the architect was tasked with creating a building with a traditional design but on a large scale. After analyzing requirements for a 1.8-m (6-ft) tall limestone cornice for the building, the architect specified architectural FRP as a lighter-weight alternative for decorative elements. 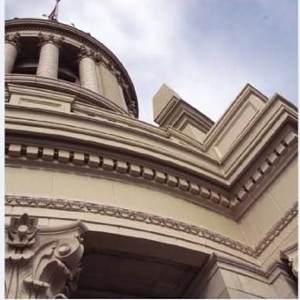 FRP was cast into elements, such as original cornices, pediments, fascia, window surrounds, and pilasters, with a high degree of detail and dimensional accuracy. These FRP pieces were also less costly to install, especially at higher locations. Small amounts of cast stone and structural glass-fiber-reinforced concrete were used for applications at lower elevations. The FRP wass produced in an aggregate finish that replicated that of stone at a fraction of the cost for both product and installation. All FRP components were produced with a Class I fire-rated formulation. Pictured on the cover is the 4.6-m (15-ft) diameter cupola dome at One Rodeo Drive, a high-end retail building. The dome has more than 10,000 Venetian glass mosaic tiles bonded to its surface. It was manufactured in two halves, and then delivered and installed over a period of three hours. The use of FRP eliminated the need for scaffolding and dramatically reduced onsite labor. The FRP also provided a more accurate and waterproof substrate for the distinctive mosaic pattern. The underside of the single-skin FRP laminate incorporated integral ribs to add stiffness where required. The FRP application is engineered for dead load, seismic, and wind requirements. Fire resistance of the dome interior was accomplished with a post-applied, fire-resistant FRP material. The manufactured dome uses Class I fire-retardant (FR) resin, a special grade of resin. Not all resins are FR-grade. Composites can be formulated to provide a range of fire resistance characteristics. For the first time, these codes standardize on requiring a Class I rating based on ASTM E 84, Standard Test Method for Surface Burning Characteristics of Building Materials . The city of Beverly Hills required the dome interior have additional spray-applied fireproofing, just as would be used on structural steel. Moving forward, the challenge lies in educating design/construction professionals on the benefits and strengths FRP composites can deliver when compared to alternative materials. Most engineers are very comfortable using other materials because they may have studied them in school. 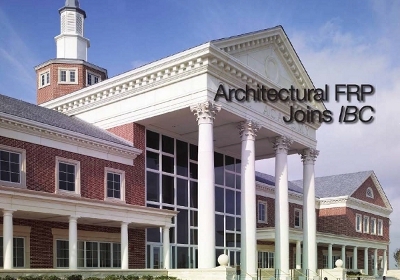 It is important to remember that for more than a half century, architectural FRP has been specified to restore buildings with artistic, historical, and landmark significance, or create architectural statements for new construction. Charles Wittman, chair of ACMA's Architectural Division, explained how code recognition builds on this heritage. "Every time we pursued a new application for architectural FRP in the past, we had to demonstrate all over again how fiber-reinforced polymer products can be designed to meet established flame spread standards," he said. "With the new code in place, we go from reactive to proactive." Bill Kreysler, an architectural fiberglass specialist, discussed the subjectivity that prevailed in the absence of a uniform code. "Without the code language, decisions about when, where, how, and why to use FRP were subjective and based to a large degree on the perrsonal opinion and/or prejudices of officials," he said. "Some were better informed than others and made better decisions." Architectural fiber-reinforced polymer is suitable alternative for various, major external and internal applications. The new International Building Code recognition can assure building officials fiber-reinforced polymer is properly employed in these applications. The code also creates new opportunities, encouraging the FRP industry to advance technologies that better serve design/construction professionals in the architectural community. John P. Busel is director of the Composites Growth Initiative of the American Composites Manufacturers Association (ACMA). He has almost 30 years of experience in designing and manufacturing FRP composites, and has led market development activities for the use of composites in civil infrastructure applications. Busel is chairman of American Concrete Institute (ACI) Committee 440 on Fiber-reinforced Polymers. He can be reached via email at jbusel@acmanet.org. Fiberglass composites will be added to the 2009 International Building Code (IBC). Fiber-reinforced polymer (FRP) materials will have to meet existing code requirements for other materials in Chapter 26, 'Plastics,' for specified applications. Despite its features and benefits, architectural FRP has seen only limited use without a uniform code. Consequently, flame spread and other performance requirements were established on a case-by-case basis between FRP manufacturers and local building authorities. This article examines the new code requirements against a backdrop of myriad FRP applications. 1 This articles focuses solely on architectural applications, as the current IBC addresses FRP in non-structural applications. Fiber-reinforced polymer in structural applications has its own set of requirements, which IBC does not focus on at this time.